ROCK FALLS – Judith D. Barnes, age 73, died at her home Friday January 10, 2014 following a short illness. Judy was born on May 13, 1940 in Tampico the daughter of Harry Near and Mary Jane Howard. She married Donald Kramer on June 7, 1956 in Ottawa. Later she married Harold Barnes on June 22, 1986. He preceded her in 2004. 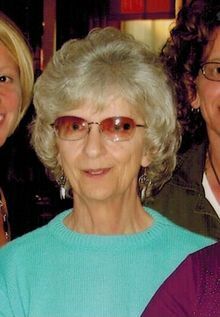 Judy was employed with Harper-Wyman Co. and Tyco Products of Sterling, Tri-County Opportunities as a grandma at Dillon School in Rock Falls and Exceptional Care and Training Center in Sterling. She was an avid reader, Elvis and Owl Collector and enjoyed quiet time with her cat. Survivors include one son, Timothy (Shannon) Kramer of Sterling; one daughter, Joanna (Jerry) Owens of Walnut; two step-sons, Jim (Dawn) Barnes of Sterling and Korey Barnes; one step-daughter, Kim (Bob) Peikert of Sterling; one brother, Roger (Mary) Near of Rock Falls; step-mom, Jan Near of Clinton, Iowa; special cousin, Shirley Wharfield of Rock Falls; four grandchildren, Amber (Jamie) Buss of El Paso, Emily Carrell of Schaumburg, Brittany (Brad) Hoffmire of Sterling and Donnie Kramer of Rock Falls; six step grandchildren; two great grandchildren, Ian and Adian Buckingham. She was preceded in death by her parents, Charles and Mary Jane Matthews; and father, Harry A. Near; one son, Dean Kramer; one brother, Rick Matthews; husband Harold Barnes. Visitation will be Tuesday, January 14, 2014 from 5-7:00 PM at the McDonald Funeral Home in Rock Falls. Funeral services will be 10:00 AM Wednesday at the funeral home with Pastor Dalmus Meeks of Harvest Time Bible Church, Rock Falls officiating. Burial will follow at Riverside Cemetery, Sterling. A memorial has been established to Serenity Hospice of Oregon.